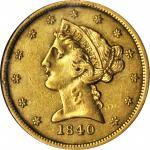 Lot:3053 1874-S Liberty Head Half Eagle. EF-45 (PCGS). 1874-S Liberty Head Half Eagle. EF-45 (PCGS).Warm honey-gold patina blankets both sides of this boldly to sharply defined example. Highly elusive in all grades, the 1874-S half eagle has a limited mintage of 16,000 coins, most of which were worn out and eventually lost in circulation on the West Coast. When we further consider that this is one of a select group of U.S. Mint issues that are currently unknown in Mint State, the significance of this problem free and aesthetically pleasing Choice EF can hardly be denied.